Information about process control, instrumentation, and industrial valves and valve automation. This blog is intended to provide interesting and educational information in areas of factory automation, measurement and control. For more information, visit Tri-State Technical Sales or call (610) 647-5700. Continental Disc Corporation manufactures rupture discs to our customers’ specifications which protect vessels, equipment and systems against damaging overpressure conditions. 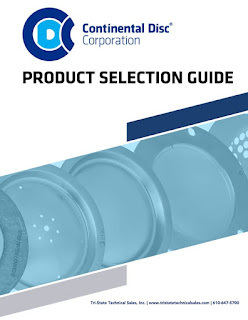 This guide provides a brief overview of the various tension and reverse acting design rupture discs, holders, accessories and options offered by Continental Disc Corporation. For detailed information regarding a specific design, refer to specific product literature, speak with your local representative or contact the factory directly.